Experience true desert living in this classic Tucson ranch in the Tanque Verde Valley. 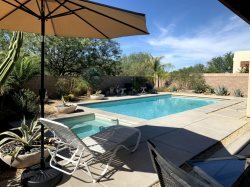 This home sits on three and a half acres of beautiful Sonoran desert in a small enclave of ranches and private residences. The home has four bedrooms, two of which also have a private bath, plus an additional guest bathroom. The home has an equipped kitchen and small dining area. This property is located on the far N.E. side of Tucson at the gateway to Redington Pass. Redington is known for its hiking, waterfalls, rock-climbing and OHV areas. It has a very secluded feeling while still being only 7.5 miles from a major grocery center with shopping, dining, pharmacy, gas station, library, etc. Note: This home is truly in the desert and you will see desert wildlife. Please be aware and respectful. Also, the property is accessed by 1/4 mile of dirt road which crosses a seasonal creek. During heavy rains you may encounter delays.